Obviously, the main reason would be their price- hand coffee grinders are much cheaper than their electric counterparts. Moreover, hand coffee grinders are much more portable hence you can always take them with you on a working trip or your ‘oh so planned’ vacation. Plus, they are also very durable and lightweight as well as easy to clean under the running water with little washing up detergent (source). How to choose a coffee grinder? 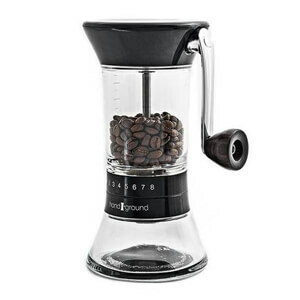 Mainly, there are two types of coffee grinders; the blade and the burr grinder. Each of these grinders’ uses a different technique to grind the beans hence the end result is also very different. Blade grinders are widely available and cost only a fraction of the burr grinders plus their main principle of work is that they smash coffee beans into many smaller bids. However, you cannot control or adjust the particle size or grind consistency. Moreover, the grind quality will largely depend on the type of coffee beans you use. Plus, blade grinders are normally made from metal instead of the usual and more expensive ceramic ones. But, they do make a good option for individuals who are just learning how to grind their own coffee beans at home. On the other hand, burr grinders are more consistent in particle size plus you can control the grind size. Burr grinders can either use conical or flat burrs depending on the type of grind the hand grinder is made. Furthermore, burr grinders are designed in such a way that when ground coffee reaches the needed particle size it falls into the catch section below. Sadly, burr grinders will cost much more than their blade counterparts. But, according to coffee lovers around the world, they are worth every penny. 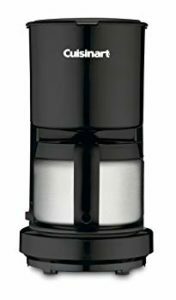 Very compact and high-quality stainless steel coffee grinder that can be stored away in the cupboards whenever you do not need it. Moreover, and it is very easy to use and clean including the ceramic blades plus you can remove the handle and store separately so as to safe space in the drawers. Also, it is very lightweight hence you can take with you on vacations and working trips so that you can always grind your favourite coffee by yourself. Furthermore, customers can choose from 3 different sized options ranging from this model which has a capacity of just 25 grams to much larger ones that have a capacity of 60 grams. A Japanese hand coffee grinder with a sleek and modern design that will complement your kitchen. Plus, it is very lightweight and you can carry it with you wherever you go. 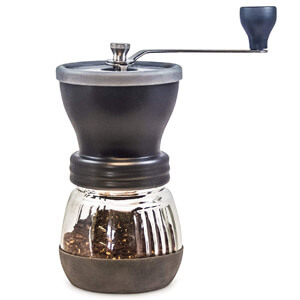 Moreover, this hand grinder comes with ceramic conical burrs that can be used to grind a number of varieties from powder to French press. However, the Osaka made Porlex is only available in one capacity, 30 grams, but that should be enough to grind fresh coffee beans for a delicious and refreshing cup of coffee. Like other handheld coffee grinders it is made out of stainless steel and should be very easy to clean. JavaPresse coffee grinders come with a built-in and fully adjustable grind selector that is made out of durable material. Plus, the 18 click setting will ensure that you have 100% control over what coarseness you wish to obtain. Moreover, the grinder is fully manual hence you do not need to worry about long cords, batteries and power sockets. This makes it perfect for travel plus it’s compact and will easily fit in your travel bag, however, some customers did report that the stainless steel body is easy to scratch. 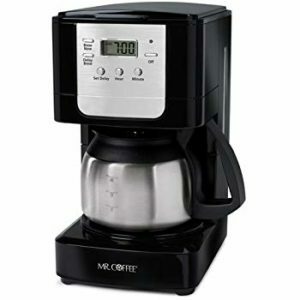 The grinding mechanism can be removed and easily cleaned under the running water plus the hand crank mechanism works well to cancel almost 90% of noise that an electric coffee grinder would otherwise make. 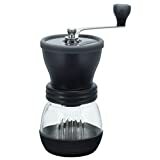 This makes JavaPresse hand coffee grinder perfect for home and office as you could quietly grind your favourite beans at your office cubicle or at home when other family members are still fast asleep. Lastly, the ceramic burrs have been extensively tested and certified as professional grade burs that are bound to last 4 times longer than conventional blade burrs. 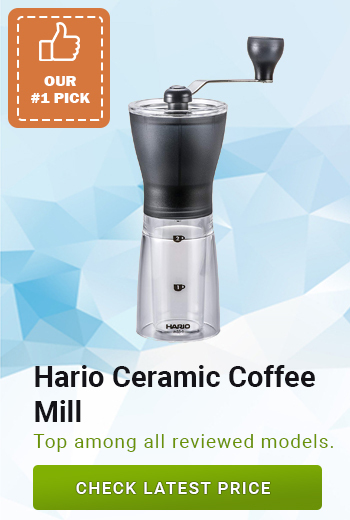 A manual coffee grinder for coffee enthusiasts who appreciate modern designs, plus it comes with durable ceramic burrs that quickly grind all types of coffee beans into premium and uniform grind. The handle has been rigorously tested to ensure it will be balanced and comfortable to use plus it is covered in a non-slip rubber material that will ensure it does not slip when you hold it regardless of whether your hands are wet or not. The glass parts of the grinder are made from reinforced and heat-resistant grade ensuring the hand grinder will not break. Moreover, the grind can be adjusted as needed while the grinder can be tossed in the dishwasher for easy cleaning. A more premium version compared to the one with more powerful ceramic grinds that were designed by a head engineer at Hario. Like other similar models, the base of this grinder is covered in the anti-slip rubber material. Moreover, the hand crank can be adjusted so as to fit a number of brewing requirements. 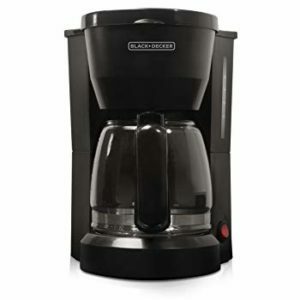 The canister is rather large and is capable of grinding over 120 grams of coffee beans in one go. 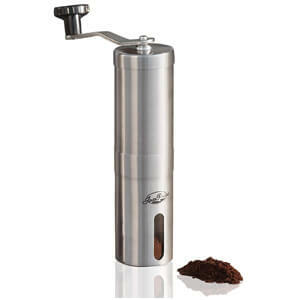 By having this hand grinder you can ensure that you will always have fresh coffee to brew in the morning. 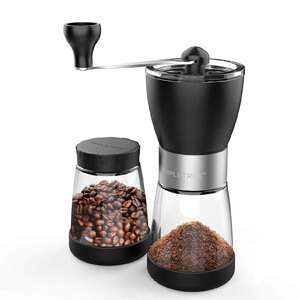 A modern stainless steel hand coffee grinder with sleek design and 25-gram capacity can be used to grind your favourite coffee beans at home or in the office as it is pretty quiet. The lid can be easily opened and closed while the silicone seal will prevent any coffee powder from sipping through and creating a potential mess. Plus, the handle has a comfortable ergonomic design and will not cause much strain to your hand or muscles when you use it. 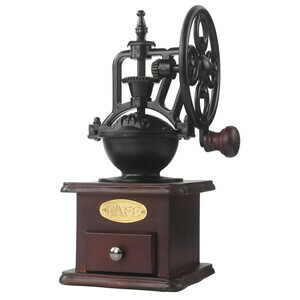 A beautiful vintage coffee grinder that is made out of cast iron and features durable ceramic burr blades that will finely grind all types of coffee beans. This hand grinder will become the perfect gift for coffee lovers around the world plus it can become the centrepiece in the kitchen. Like all other handheld coffee grinders, it does not require batteries, power cords or power sockets thereby leaving it up to you decide where to place it around the kitchen. Moreover, despite its solid look it is quite compact and can be stored away in the cupboards if you have limited countertop space. Plus, the catch drawer is completely sealed hence the grinding process will not cause much mess. In addition to grinding coffee, Moon-1 handheld grinder can be used to grind sugar, cocoa, cinnamon and nutmeg. A new model by Triple Tree that features a longer stainless steel handle to save you the time and effort needed to grind the coffee beans. Plus, the ceramic burrs do not give out heat during the grinding process hence the freshly ground coffee will not lose its taste properties or aroma. 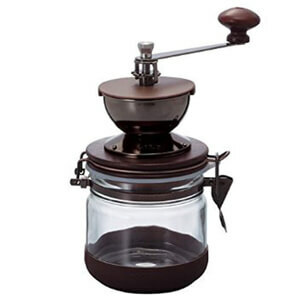 Moreover, you can store the freshly ground coffee in the grinders jar for up to 10 days. Also, the handle can be adjusted to control the type of grind or it can be removed altogether for easier cleaning and storage. The removable lid is also convenient to be used to add beans. The Khaw-Fee manufactures offer a 2-year warranty on this hand grinder plus customers have reported that it is really very quiet yet efficient. 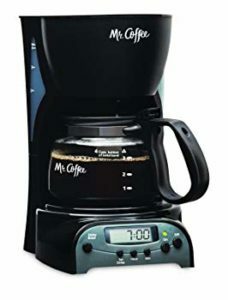 It is capable of grinding 20 grams of coffee beans in less than 5 minutes plus you can control the level of grinding by either tightening the handle or letting it go a bit lose. 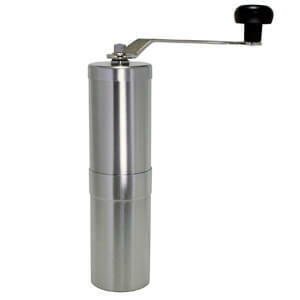 You can grind all types of coffee beans on this grinder, especially for cold brew, espresso stovetop and French press. The design is rather simple, the handle is made out of stainless steel while the body is made out of reinforced glass covered in anti-slip material. Unfortunately, this hand grinder is not dishwasher safe hence you will need to gently wash under the running water with little dish soap. But, customers did report that this little nuisance did not matter because the Khaw-Fee Manual Coffee Grinder works very well and rarely breaks. 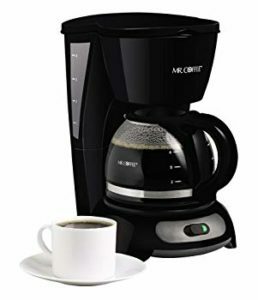 Plus, some users have reported that the coffee grinder works well with all types of coffee beans including whole beans that are much oiler than other types of coffee beans commonly found in supermarkets and grocery shops. Hand Ground is an American company that has been set up by several coffee lovers that wanted to design their own coffee accessories based on the numerous reviews, demands and suggestions they received from the coffee enthusiast’s community in their local area. The result was the Hand Ground Precise coffee grinder that is made out of glass and stainless steel. Plus, you can select the most suitable grind option from 15 different settings that include a grind for cold brew, French press, drip and chemex. Moreover, the ceramic conical burrs are mounted to the lid using a triple axel mount that will eliminate any instability and wobble. In addition to being more stable, the ceramic burrs will last much longer than the conventional metal once. 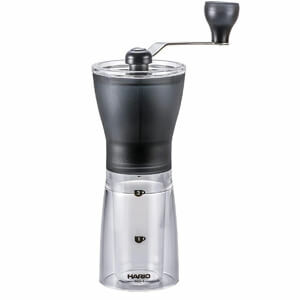 Also, the Hand Ground Precision Coffee grinder is very quiet, lightweight and above all portable. You can take it with you anywhere you like. In conclusion, I would like to say that if you can afford a good burr grinder then you must definitely invest in one. However, keep in mind that burr grinders tend to take up much more countertop space than simple blade ones. They also weight a bit more than blade grinders do, moreover, burr ones can last much longer than blade home grinders. 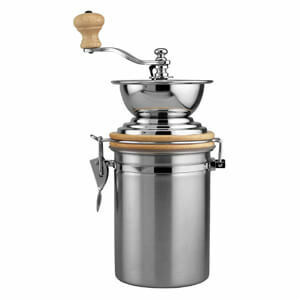 Furthermore, keep in mind that the coffee markets offer a wide range of home grinders varying in design, size and price. Always carefully inspect the model's specification and power of grinding so as to evaluate how effective the grinder will be. You could also read the reviews left by customers with an authorized purchase, however, relay on your own needs when choosing what model of hand grinder to buy because some grinders might take ages to grind enough coffee beans for a large group of friends or family. If you regularly hold such large parties and tend so serve coffee with the dessert then you might need to look at more professional models that will, unfortunately, cost much more.